On this 7-night Mekong Expedition Cruise you will discover all the mysteries and wonders between the Mekong and Tonle Sap Rivers. In High Water Season (mid-August - November), from Siem Reap to Ho Chi Minh experience the full history of Mekong life, meeting Khmer farmers, Buddhist monks and Vietnam’s kaleidoscopic wet markets along the way. Sailing in the opposite direction, from the colonial chic of Saigon to the legendary Angkorian heritage in Siem Reap is to travel leisurely back in time across this legendary landscape. During the Low Water Season (December - mid-August), our program includes much more time on the Cambodian stretch of the Mekong and along the Tonle Sap River. High Water Season runs from mid-August to November and Low Water Season from December to mid-August. Upriver itineraries differ between seasons, Downriver itineraries remain the same year-round, however please note that all itineraries are dependent on the river water level, weather conditions, and accessibility to locations, so may vary. We will collect you at the Saigon meeting point and transfer you by air-conditioned coach to My Tho dock where we will welcome you aboard the Aqua Mekong. Settle into your floating retreat, with its window wall conferring an endlessly captivating panorama. 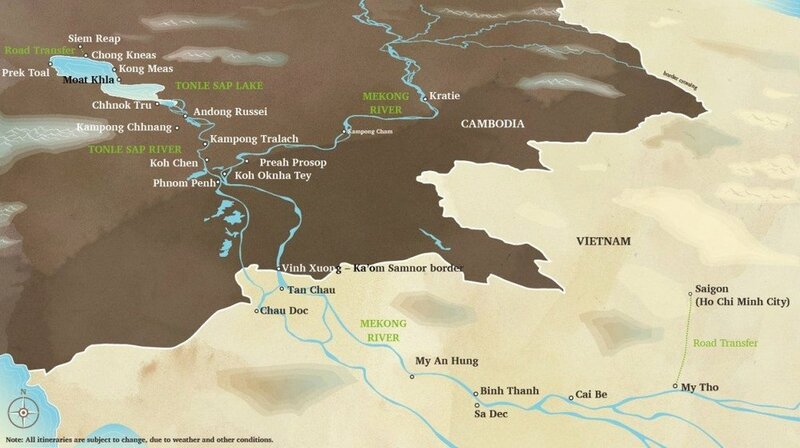 Enjoy these private Mekong moments on your California king bed, terrace or daybed. Begin the day at Binh Thanh mat weaving village or opt to visit Sa Dec where we will peruse the vibrant market and see the famous house of Marguerite Duras' legendary lover, Mr. Huynh Thuy Le. In the afternoon, visit a typical Mekong Delta village called My An Hung where we will walk through verdant plantations. We will be invited to a local's home to taste local fruits while hearing traditional folk songs performed by villagers followed by a unique unicorn dance. A 17-kilometer Biking option is also available. Travel by skiff along Bassac Canal to Chau Doc floating market then head off by van to Long Son Pagoda atop Sam Mountain. Ask the monks about their age-old Buddhist practices. Return via the bustling morning market. Optional 18 kilometers bike ride on Long Khanh Island or take a rickshaw ride to visit Tan Chau Market with chef. After lunch, relax by the pool, try traditional Khmer massage or learn to cook Mekong inspired dishes while we cross the border. Return to welcome our 3-night passengers over custom sundowners like the Salted Watermelon Crush with Thai basil. Together we celebrate the onward journey towards the heart of this mighty river with a Khmer Apsara performance, an indigenous tradition memorialized on the temple walls at Angkor Wat. This morning, we visit Koh Chen, a silversmith village known for its fine craftsmanship. Keep an eye out for their famous silver bowls, regularly chosen by Cambodia's king as gifts for visiting dignitaries. In the afternoon, we continue learning about Khmer riverside life in Kampong Chhnang, the 'Port of Pottery' so called because archaeological findings here date to the 6th century. Bike option is available. Continue exploring the remote communities around the Tonle Sap Lake, designated as a UNESCO Biosphere Reserve in 1997. In Chhnok Tru, we “slide” into an ice factory and learn from locals what it’s like to live in a town where schools, churches, pagodas, and even the karaoke bar and police station all float. After lunch, we visit the floating village of Moat Khla, accessible only by water, and attend a Buddhist blessing ceremony. Set off by skiff into the 22,000-hectare Prek Toal Core Bird Reserve, one of the largest freshwater bodies in Asia and the last refuge in Southeast Asia for large waterbirds like the spot-billed pelicans, milky stork, black-headed ibis and the elusive masked finfoot. Disembarkation. Gather at our Siem Reap meeting point then board our air-conditioned bus for the scenic 45-minute countryside ride to the dock on the Tonle Sap Lake for check-in to your 3-story, five star Mekong abode. Settle into your floating retreat, with its window wall conferring an endlessly captivating panorama. Enjoy these private Mekong moments on your California king bed, terrace or daybed. Set off by skiff into the 22,000-hectare Prek Toal Core Bird Reserve, one of the largest freshwater bodies in Asia and the last refuge in Southeast Asia for large waterbirds like the spot-billed pelicans, milky stork, black-headed ibis and the elusive masked finfoot. After lunch, we visit the floating village of Moat Khla, accessible only by water, and attend a Buddhist blessing ceremony in this isolated community. Explore remote villages around the Tonle Sap Lake, designated as a UNESCO Biosphere Reserve in 1997. In Chhnok Tru, we “slide” into an ice factory and learn from locals what it’s like to live in a town where schools, churches, pagodas, and even the karaoke bar and police station all float. We continue learning about Khmer riverside life in Kampong Chhnang, the 'Port of Pottery' so called because archaeological findings here date to the 6th century. This morning, we visit Koh Chen, a silversmith village known for its fine craftsmanship. Keep an eye out for their famous silver bowls, regularly chosen by Cambodia's king as gifts for visiting dignitaries. In the afternoon, we set off for the Mekong's 'silk islands' where renowned weavers allow us to wander freely, admiring their intricate craftsmanship. Biking is optional for those who wish to explore deeper into the island. Say ‘Good Morning, Vietnam’ while we cross the border and sail towards Tan Chau, a vibrant border town where we take the local rickshaw called xe loi for a trip around town or pedal 18 kilometers on the peaceful island of Long Khanh. In the afternoon, we visit a typical Mekong Delta village called My An Hung where we will walk through verdant plantations. We will be invited to a local's home to taste local fruits while hearing traditional folk songs performed by villagers, followed by a unique Unicorn dance. Biking option is also available for those who wish to explore on wheels. Begin the day at Binh Thanh mat weaving village or opt to visit Sa Dec where we will peruse the vibrant market and see the famous house of Marguerite Duras' legendary lover, Mr. Huynh Thuy Le. We continue downstream for Cai Be, zigzagging in our sampan past lone fishermen on their long tail boats. Later, our skiffs moor at a wooden pier. Here in Cai Be, walk or bike ride among high-roofed open courtyard houses, some dating back more than 100 years, and currently inhabited by gracious locals who will invite us to glimpse their property. Disembarkation. En route to Saigon, we stop at Vinh Trang Pagoda, one of the largest Mahayana Buddhist temple in the region. You will notice the mixed architectural style and see three large buddha statues plus an impressive collection of bonsai trees. In the silversmith village of Koh Chen, we watch artisans producing the magnificent silverware favored by Khmer royalty. We continue to Udong, the royal capital from the 17-19th centuries, where we learn about a uniquely challenging Buddhist practice at the Vipassana Dhura Mandala, a meditation center. In the afternoon, a walking tour of Kampong Prasat offers a close up perspective on local lives and their riverside environment. In the cooler hours, we head into the lush countryside to visit traditional potters and palm-sugar producers, astride mountain bikes or chauffeured by shaded tuk-tuk. Into the rice paddies we pedal to watch wizened masters scale sky-piercing palms towering over us. Cruise across the glassy water and disembark among the lotuses for an ox-cart ride along the Tonle Sap riverbanks, past lacquered wooden houses where during these dry months residents take refuge in the relative cool of these outdoor impromptu living rooms. Welcome our 3-night passengers over custom sundowners like the Salted Watermelon Crush with Thai basil. Together we celebrate the onward journey towards the heart of this mighty river with a Khmer Apsara performance, an indigenous tradition memorialized on the temple walls at Angkor Wat. Disembarkation. En route to Ho Chi Minh, we stop at Vinh Trang Pagoda, one of the largest Mahayana Buddhist temple in the region. You will notice the mixed architectural style and see three large buddha statues plus an impressive collection of bonsai trees. 1) Upriver cruises are underlined. 2) BOTH Upriver and Downriver cruise itineraries are different in Low and High Water Seasons.